Java Data Objects revolutionizes the way Java developers interact with databases and other datastores. 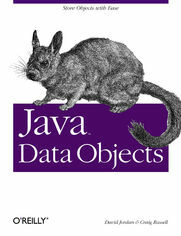 JDO allows you to store and retrieve objects in a way that's natural to Java programmers. Instead of working with JDBC or EJB's container-managed persistence, you work directly with your Java objects. You don't have to copy data to and from database tables or issue SELECTs to perform queries: your JDO implementation takes care of persistence behind-the-scenes, and you make queries based on the fields of your Java objects, using normal Java syntax. The result is software that is truly object-oriented: not code that is partially object-oriented, with a large database-shaped lump on the back end. JDO lets you save plain, ordinary Java objects, and does not force you to use different data models and types for dealing with storage. As a result, your code becomes easier to maintain, easier to re-use, and easier to test. And you're not tied to a specific database vendor: your JDO code is entirely database-independent. You don't even need to know whether the datastore is a relational database, an object database, or just a set of files. This book, written by the JDO Specification Lead and one of the key contributors to the JDO Specification, is the definitive work on the JDO API. It gives you a thorough introduction to JDO, starting with a simple application that demonstrates many of JDO's capabilities. It shows you how to make classes persistent, how JDO maps persistent classes to the database, how to configure JDO at runtime, how to perform transactions, and how to make queries. More advanced chapters cover optional features such as nontransactional access and optimistic transactions. The book concludes by discussing the use of JDO in web applications and J2EE environments. Whether you only want to read up on an interesting new technology, or are seriously considering an alternative to JDBC or EJB CMP, you'll find that this book is essential. It provides by far the most authoritative and complete coverage available.